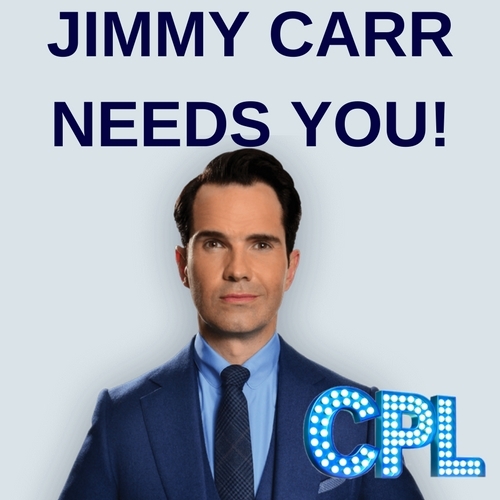 Lost in TV - JIMMY CARR NEEDS YOU! Click 'I Accept' below to consent to the use of this technology. To find out more, please see our cookies policy here. CPL Productions, the brains behind A League of Their Own and Old People’s Home for Four Year Olds, are looking for confident, outgoing people to be in the audience for a new entertainment show run through where YOU, the Great British public will be able to ask a panel of celebrities - Anton Du Beke, Ricky Wilson, Judy Murray and Charlotte Crosby - anything you like. … And hosting the evening will be none other than award-winning comedian Jimmy Carr. WOULD YOU LIKE THE CHANCE TO BE IN THE AUDIENCE? THEN WE WANT TO HEAR FROM YOU! Please note that if successful, you will be a part of an interactive audience meaning you will be expected to speak on camera if called upon. By applying for this show, you agree to be a part of our interactive audience and should come prepared with questions to ask Jimmy and our panel of celebrity guests. This show is not currently recording. Please register your interest for future shows or returns by logging into your account and using the form below. We'll then be in touch when we have news. If you aren't registered with us, please register first and then log into your account to add yourself to the waiting list. Please sign in or create an account in order to be added to this notification list.